Prevent unauthorized access to or from your private network. The heart of strong data security is a well configured firewall. Firewall software installed on the pc or laptop is generally referred to as personal or client firewall. Some antivirus software packages offers an integrated firewall edition. This protects the computer from being attacked over the internet by hackers, viruses, worms and scans incoming emails and attachments. Generally, a hardware firewall which integrates to the internet router or modem is called as network or appliance firewall. 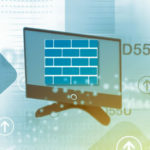 Some SOHO routers come with a basic inbuilt firewall but for a really secure network, a business grade hardware firewall device should be used. Stateless or packet filtering firewalls have been around for long time and are very common. Most internet routers have an inbuilt firewall with similar features which merely filters internet traffic using certain inbuilt or defined rules. These types of firewalls are not highly resource intensive. By way of contrast, stateful inspection firewalls offer end to end security and work alongside packet filtering by keeping the TCP session active. Such platforms examine and filter network traffic from multiple layers. These features do make the device more resource intensive.